Four Colorado Mountain College students were among 27 future educators honored at the state Capitol on May 8 in the inaugural ceremony of Coloradoâs Aspiring Educator Honor Roll. The initiative to create the honor roll came from Dr. Kim Hunter Reed, the executive director of the Colorado Department of Higher Education. 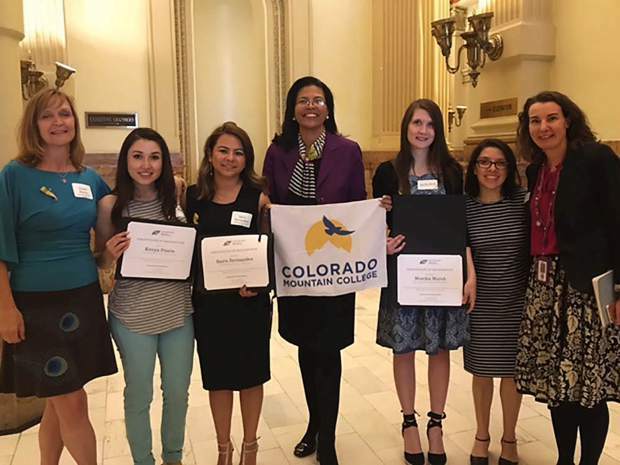 Hunter Reed, center, is here with, from left, CMC Edwards student Cherie Rollins, CMC Glenwood Springs student Kenia Pinela, CMC Edwards student Saira Hernandez, Hunter Reed, CMC Glenwood Springs student Monika Marsh, CMC faculty Dr. Leticia Burbano de Lara and Dr. Katy Anthes, the Colorado Department of Education commissioner of education.